Movement | Play and development | KaBOOM! Playing tag, jumping rope, swimming underwater—children need to move their bodies a lot throughout the day. Moving around feels good, gives children energy, burns calories, and also helps develop many other skills. Big body movements involved in activities like running, throwing balls, and swinging bats develop strength and coordination. Crawling enhances strength, balance, and visual acuity. When children move in sports and games like tag, they develop communication and social skills. Dancing and pretend play movements plant the seeds for creative thinking and problem-solving. Through fine motor movements such as drawing, coloring, and building with small blocks, children practice control and gain the self-confidence needed for life-long learning. Movement and play go hand-in-hand! 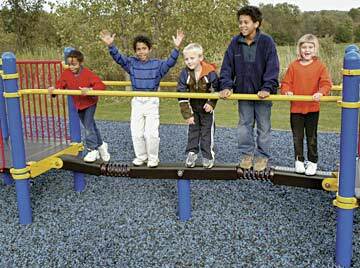 With creative design, your playspace will naturally nurture and encourage lots of movement. Select some toys that get children to move their bodies, like tricycles and plastic toy cars. Simple jump ropes, plastic balls, sit-and-spins, swings, or slides also do the trick. Leave room for children to run back-and-forth in a game of tag, roll their big wheels, or just to roll on the ground a little.